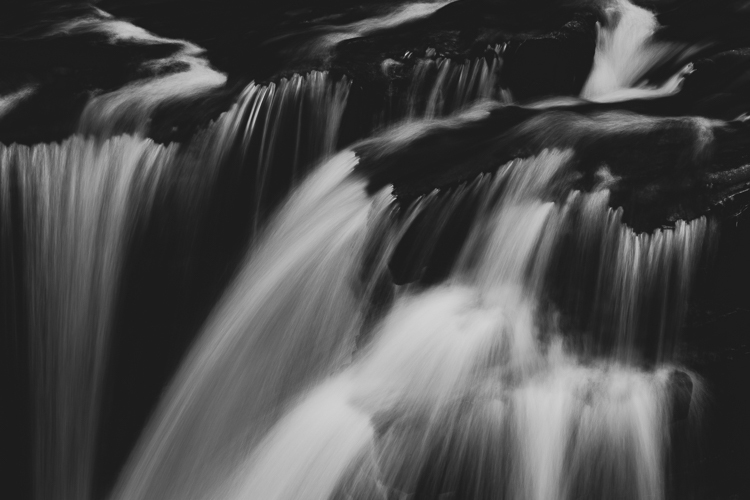 I have recently started a long-term collaberation with two other local photographers. Hopefully I will be able to reveal more over the coming months, but for now here is an image captured in one of the locations I will be visiting for this project, but not one that will be included! I have recently updated and redesigned this website to focus mainly on my project work. If you are having problems and trying to find something in particular please contact me using the form below. I'm delighted that one of my images was recently Commended in this year's Take-a-View Landscape Photographer of the Year awards. The image was captured in St Mary's Vale at the base of Sugar Loaf mountain near Abergavenny and is a particularly wide panoramic made up of over 10 handheld shots. It will be shown at the exhibition in Waterloo station from 19th November 2018 - 3rd February 2019 and it is also included in the awards book published by the AA. Congratulations to all those who were successful this year. A couple of months ago I started a collaberation with fellow photographer Rob Hudson reconnecting the remains of the Glamorganshire Canal throught photography with double exposures. We both exposed the same 35mm film at two different ends of the canal on a couple of the remaining stretches of water - myself in Aberdare and Rob at Forest Farm. The results of this first film have now been published on a dedicated twitter feed (@ReconnectingThe) and are also available to view on the Reconnecting the Canal project page. 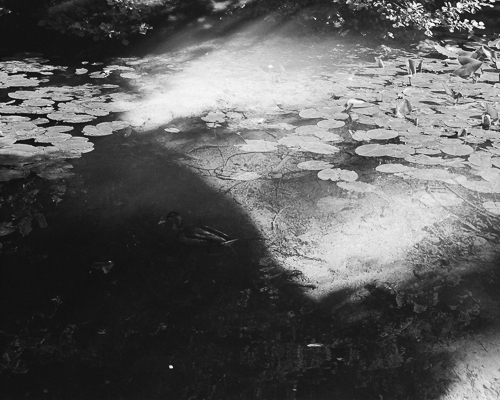 We plan to shoot another roll of film at two new locations along the canal over the next month. Thanks to everyone who visited my Ephemeral Pools exhibition at Red House in Merthyr Tydfil last month. I am particularly greatful for all those who left feedback in the comments book - it's nice to know the work was appreciated. If any other galleries are interested in exhibiting this series please contact me. 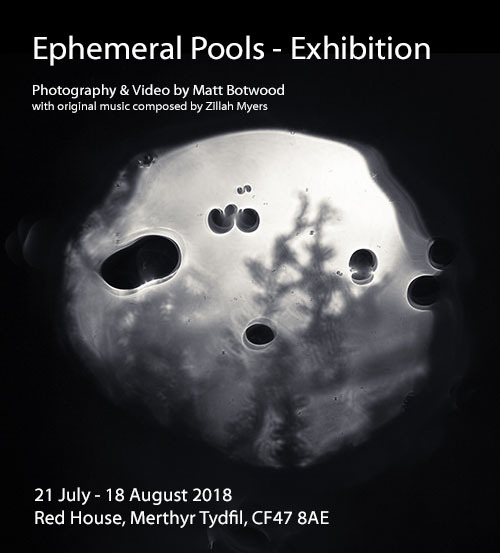 My Ephemeral Pools exhibition at Red House in Merthyr Tydfil runs until Saturday 18th August. If you are planning a visit from any significant distance please check with the gallery beforehand as it is occasionally used for meetings during the day. Thanks to those who came to the opening day, it was good to put some faces to names on social media. If you are interested in a print from the series I am offering limited editions of 10 prints in two different sizes (19cm and 25cm squared). Please email to check availability for a specific image. All of the images from the Ephemeral Pools project can be viewed on the gallery pages. There have been some recent additions to my abandoned shopping trollys project over the last month as a result of my wanderings around Aberdare. 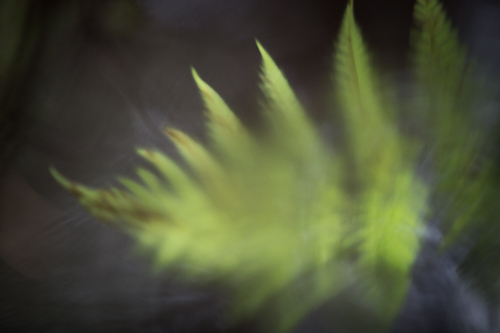 My Ephemeral Pools project has recently been featured on the landscape photograpy collective website Inside the Outside. Have a look for an insight into the project and to see some of the images that will not be in my forthcoming exhibition. Thanks to those people who expressed interest in my strictly limited edition Ephemeral Pools book. They have now all sold out and will be dispatched just before the opening of the exhibition at Red House in Merthyr Tydfil. Preparations for the exhibition are complete and I hope to see those who are able to attend at the opening event on Saturday 21st July between 1pm and 3pm. The opening coincides with the Merthyr Food Festival and daily parking is available for just £1. My Ephemeral Pools project has now finished. I am currently in the process of selecting the images that will be included in an exhibition to be held at Red House in Merthyr Tydfil from 20th July - 18th August. I am planning on having an opening event on Saturday 21st July to which all are welcome, but please let me know if you are interested in attending so that I can plan for numbers. A particularly frosty walk on the hills above Aberdare has allowed me to add two new sets of images to my long-running Winter Roads series. A series of abstract images which has always fascinated me and will undoubtedly continue to be added to in the years to come. 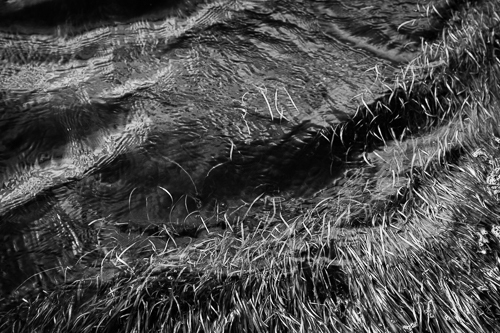 I have recently made a start on capturing what I expect to be the final images for my Ephemeral Pools series. These should be published on social media and this website over the next few months while I prepare for the planned exhibition at Red House in Merthyr, scheduled for July. During this year I plan to reorganise my website (and possibly redesign it) to place the emphasis fully on my project work and remove a lot of the standard landscape image galleries. However, these images will still be available to purchase on request and via Sable & Hogg gallery in Brecon for the rest of this year. Some snow at last! No new images added to the usual landscape galleries, but see the image of the month for some of the white stuff. The last month has also seen some new additions to my occasional series of abandoned shopping trollys. While my main camera of choice over the last few months has been my iPhone I am starting to reevaluate my goals for photography in 2018 and look for new projects to focus my attention on. A new season brings new lighting conditions within the depths of the forest that is the location of my Ephemeral Pools series. This has opened up new opportunities for images along the lines of my Celestial Bodies images from last year. A few of these new images have already been added to the Ephemeral Pools gallery pages and more are likely throughout this month. Some new woodland images have also been added to the gallery pages this month, some of which surprisingly were captured on my family summer holiday in Portugal, but it might not be obvious which these are. The end of summer brings more favourable weather conditions for the types of landscape image that interest me most, so I look forward to capturing a wider of variety of imagery over the next few months. I have continued to add to my Ephemeral Pools series over the last few months - this is likely to continue until an exhibition of the series planned for next summer. During August I will be posting a taster of some of my older projects on both Twitter and Facebook. Follow the #ArchiveAugust hashtag to see these.